Laura has taught collegiate mathematics and holds a master’s degree in pure mathematics. The Triangle Midsegment Theorem is extremely useful in real-world applications. This lesson will state the Triangle Midsegment Theorem, apply it to an example, and then provide a proof of the theorem. 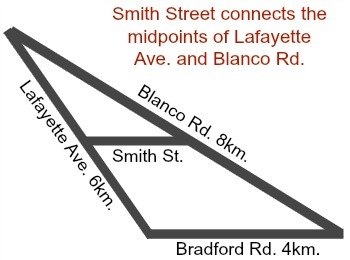 Suppose there are four roads in your neighborhood, such that three of the roads form a triangle, and the fourth road (Smith Street) connects two of the other roads at their midpoints. The line segment will be parallel to the third side. The length of the line segment will be one-half the length of the third side. In terms of the roads, this tells us that Smith Street is parallel to Bradford Road, and that Smith Street is one-half the distance of Bradford Road. Neat! We can use the theorem to determine that Smith Street has length 2 km, since 1/2 × 4 = 2. The proof of this theorem involves proving both of the properties using a series of logical deductions along with several other theorems and properties. We definitely want to see this proof, so let’s first familiarize ourselves with some facts and properties that we’ll need to use to carry out the proof. Get ready for a lot of information at once. However, it will be not only useful, but essential to have these to look at when we do the proof. If you’re unfamiliar with why these facts are true, don’t worry. They’re just here for reference. We’re more interested in the facts themselves. 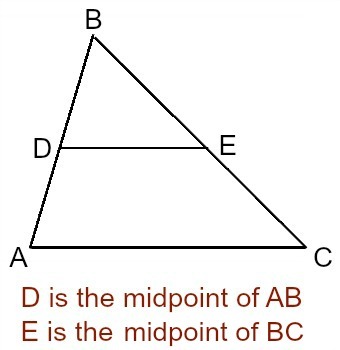 AD = BD and CE = BE, because D and E are the midpoints of AB and BC, respectively. Side Angle Side Triangle Similarity Theorem: Triangles are similar if the ratio between two corresponding sides is equal to the ratio between another two corresponding sides, and the angles between those corresponding sides have the same measure. Similar triangles have corresponding angles of equal measure, and corresponding sides are proportional, or create the same ratio. Converse of the Corresponding Angles Postulate: If we draw a line, called a transversal, through any two lines, and it creates two corresponding angles that have equal measure, then the two lines are parallel. Okay, I told you it was a lot of information all at once, but we’re going to be very glad that we have it handy when we do this proof. Speaking of which, we’re all set! Let’s do this! Given a triangle ABC, let’s draw a line segment connecting the midpoints of two of the sides, say AB and BC. DE is one-half of AC. That is, DE = (1/2)AC. DE is parallel to AC. Consider the ΔABC and ΔDBE. We just showed that the ratio between corresponding sides DB and AB and between corresponding sides BE and BC are both equal to 1/2. Also, notice that these two triangles share the angle B, so we know the measure of the angle between these two sets of corresponding sides have equal measure. Therefore, by the Side Angle Side Theorem for Similar Triangles, we have that ΔABC is similar to ΔDBE. Since ΔABC is similar to ΔDBE, we have that all of the corresponding sides of these two triangles are proportional and create the ratio 1/2. This is exactly what we wanted to prove for part one! All we have left is part two. That is, we need to prove that DE is parallel to AC. Because ΔABC is similar to ΔDBE, we have that the two corresponding angles, ∠BDE and ∠BAC have the same measure. Notice these are also two corresponding angles if we were to draw the line, or transversal, AB through the two lines AC and DE. Therefore, by the Converse of the Corresponding Angles Postulate, we have that DE must be parallel to AC, and this proves part two! Ta-da! We’ve proven both parts of the Triangle Midsegment Theorem, so we’ve proven the theorem! That wasn’t so hard, was it? The proof of this theorem is simply a matter of using properties of similar triangles and corresponding angles to logically deduce that both of the properties in the theorem are true. This theorem is extremely useful in many real-world applications. The next time we need to use this theorem, we not only know the theorem and how it works: thanks to the proof of the theorem, we also know why it works. Visit the Big Ideas Math Geometry: Online Textbook Help page to learn more. Triangle is a most important two dimensional polygon in mathematics. In geometry, we deal with various geometric figures like rectangle, square, cube, parallelogram etc. Among all triangles are polygons with three vertices and three edges. Many practical problems are based on triangle theorems such as Side-Splitter Theorem, Angle Bisector Theorem and Area Ratios of triangle. Triangle mid segment is one of the basic theorems on triangles which explains a very important property of triangles. 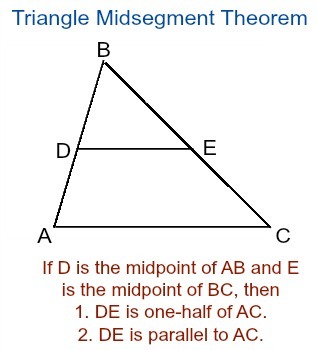 Before working on midsegment theorem first we should know about “midsegment”, A midsegment of a triangle connects the midpoints of two sides of a triangle. In this section will study about triangle mid segment theorem in detail. Statement: A segment that joins the mid points of any two sides is measure half of the length of third side and also parallel to it. That is, ST = $\frac12$ QR and ST ll QR. Since S and T are mid points of triangle. Which shows that both the triangles are similar. Statement: The straight line passing through the mid-point of one leg of a triangle bisect another leg at its midpoint. => T is midpoint of PR. Example 1: If the vertices of any triangle are (3, 5), (1, 3) and (5, -2). Show that mid segment is half the length to the side opposite to it. Solution: Consider a triangle ABC with vertex coordinates A(3, 5), B(1, 3) and C (5, -2). Example 2: Find the value of m. ST is parallel to RQ. Solution: Since mid segment of a triangle is half the length of its parallel side. The value of m is 15 units. lengths of RS and YZ if RS = x – 3 and YZ = 4x – 16. Therefore, length of RS is 2 units and length of YZ is 4 units.